and also the faux boiserie that I used french armoire doors to create. They make fantastic shabby molded swags and bows and all kinds of yummy pieces!! and the one that I used on the pediment piece is a dainty swag that comes in 3 pieces. They are white in color and highly detailed. and attached it using regular glue and let it dry overnight with chalk paint cans on it to hold it down. make them more pliable and bendable. 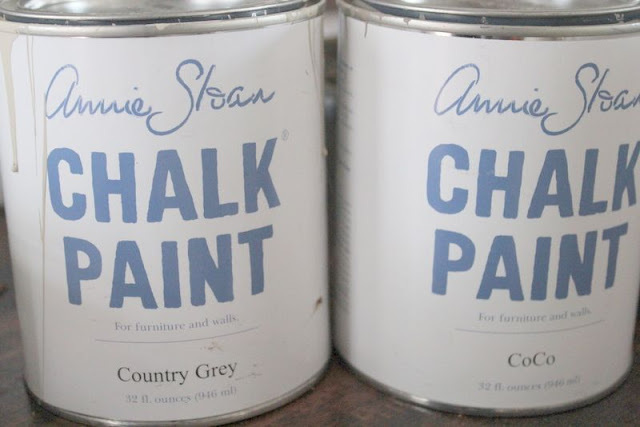 After they were dried, I used Country Grey Chalk paint and gave it a once over. the next coat that went on was Coco which is basically a brownish grayish color. and also work the the dark wax into the nooks and crannies of the applique to accent it a bit more. making a faux boiserie wall and using the architectural detail at the top. 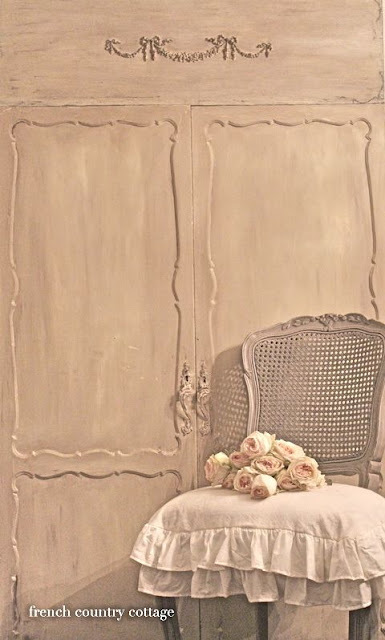 When I started to paint the doors were pink with faux silver leaf detailing. and dark wax and brushed in places giving it a bit of a streaky aged looked. 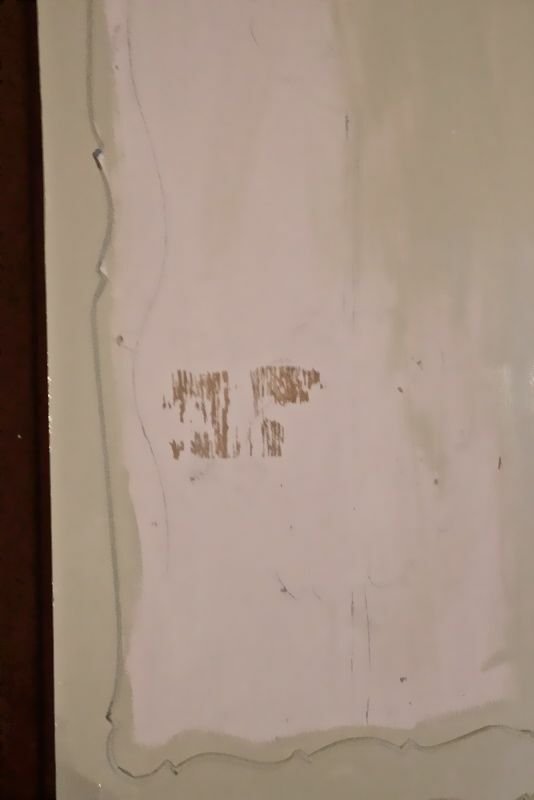 I just brushed it where I liked it and added extra wax in the detailed areas and corners. I also painted the handles and used the wax on them to age them a bit more as well. I sanded the edges and the detailed edging that is on each of the doors. at the top of the doors that easily hold the board in place. I just took a bit of the paint off to reveal some of the faux silvering and pink. A little applique... a little chalk paint.. and a little elbow grease. See you Thursday for Feathered Nest Friday! Courtney, this is gorgeous! You always amaze me! I love it so far- I can't wait to see the total reveal! Happy painting! Thanks Courtney for the tutorial.I just found a cute headboard that I am going to try this on.That looks amazing.I love the technique you used. Just beautiful Courtney...I have an armoire in the garage I want to do but have just been so busy! Maybe this month....you've inspired me. Thanks for the tutorial. I've never used that gray...just Paris Gray and I use it cut 50/50 with Old White most if the time. I think I like the French Linen color too....saw it in a pic. Your armoire is lovely. ps. can't wait to meet you..you'll love second Sunday.. I love appliques. These are beautiful, Courtney. Love your design. I have a source in Illinois called Decorators Supply Corporation. They did all the original detailing in the old Marshall Field's, downtown! They are really inexpensive...and there is nothing else like their ornaments! I just discovered they are also on Facebook! I want to do my ceilings with this...in due time! Thank you for the tutorial. You have made something really pretty. You really are very talented. It looks just amazing how you transformed those doors from great to fabulous. Thank you for your tutorial - I love those little swags. Thanks for hosting Feathered Nest Fridays. I so enjoy it. It's just gorgeous! You are so talented, I always love to look at your photos. This is wonderful. Thanks for your tutorial. Love the end product it is beautiful. Love from South Africa. That turned out beautifully! 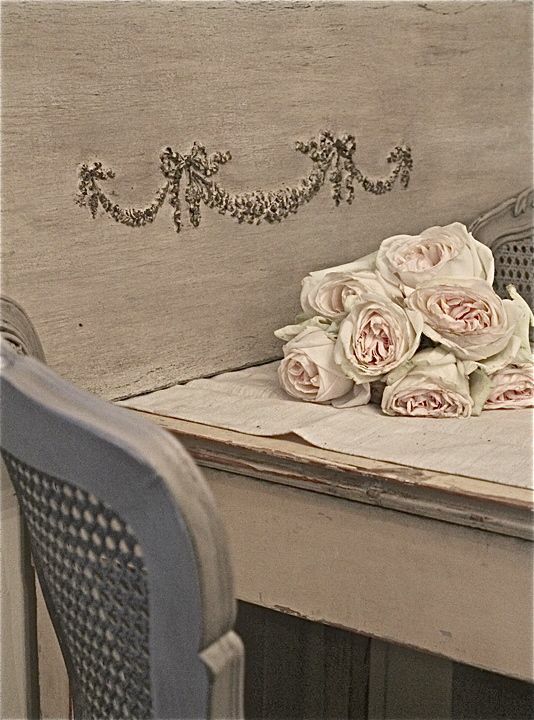 I love appliques, I recently used some on my fireplace redo. They just add so much to a piece. Hi, Just came here from Pinterest! Love your blog, I love French style too. 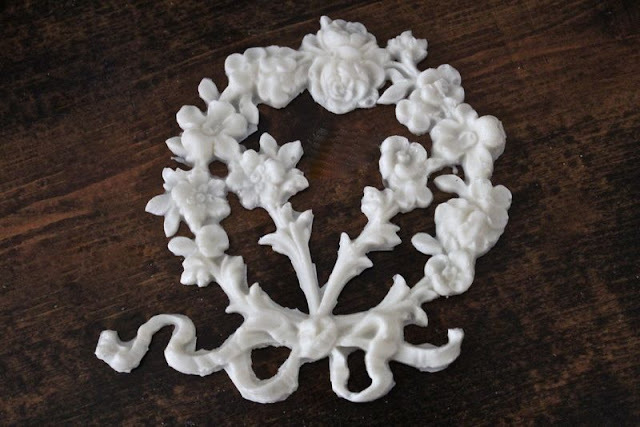 Great tutorial, mouldings are great to add interest! I find them hard to find where I live. Looking forward to reading all your other posts. Great tutorial. I love this project it is beautiful!!! Great job. I forgot to mention that I am trying thischalk paint for the first time on a project. I am very excited!! This could easily be the cover of a magazine.... Congratulations! Beautiful Courtney! Thanx for coming to party! 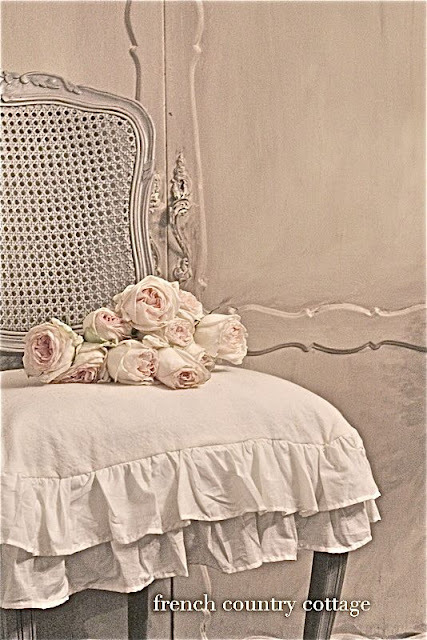 How Romantic and what Lovely Images... Loving that Annie Sloan color palette too! Thanks for sharing the How-To... I'm Hoping to paint some Furniture this Spring and do some color wash on the walls of this Old House.